The State Government also announced it would fund projects replicating the successful GROW initiative in both Ballarat and Gippsland, with other city centres to follow. The principle of GROW is to encourage enterprises to strategically buy and employ locally, and in doing so specifically create opportunities for work for disadvantaged communities. This is GROW Social Procurement. 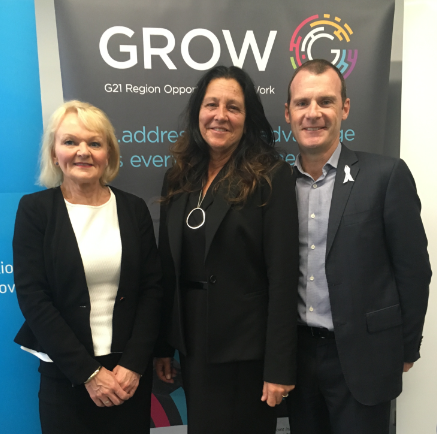 Bill Mithen, Give Where You Live Foundation CEO welcomed the announcement of funding to help secure GROW’s work within the G21 region. “Some 82 businesses and other organisations have signed the GROW compact, committing to procure and employ locally wherever practical. Elaine Carbines, G21 – Geelong Region Alliance CEO said addressing long-term entrenched disadvantage was in many ways about cultural change and collective action. This new funding is in addition to the State Government’s contribution of $1million for the first five years, and $100,000 to help develop the original GROW Strategic Plan. Give Where You Live Foundation committed $2 million as well as ongoing operational support and in-kind contributions over 10 years, while G21 provided $30,000, plus an ongoing in-kind contribution.